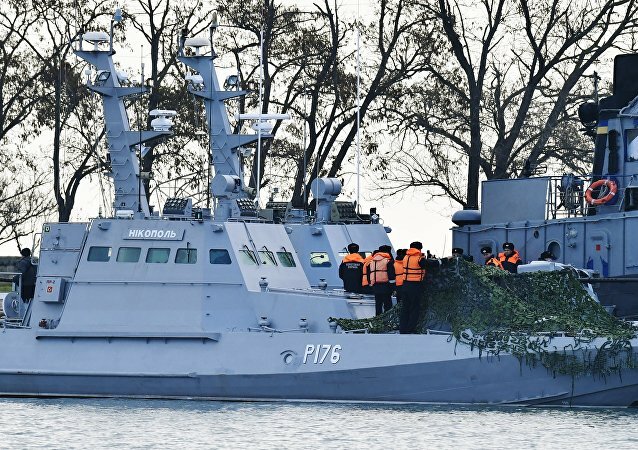 ‘During the search of the detained Ukrainian naval boats, a document was found on board the Nikopol vessel … that contains direct orders to make a secret passage from Odessa to Berdyansk, with focus on a covert approach to and navigation through the Kerch Strait’, the FSB said in a statement. ‘It is soft tissue damage, no broken bones or tendons, it is alright. I think that they will be released from a hospital in three-four days’, Lubina said. Later in the day, Russian Human Rights Commissioner Tatyana Moskalkova confirmed that injured Ukrainian sailors were out of danger. ‘Three injured people remain in hospital, their state of health is not deteriorating. As the chief doctor of the hospital told Crimean Ombudsman [Lyudmila] Lubina, their lives are not in danger’, Moskalkova told Sputnik. Moskalkova also added that the Crimean ombudsman was in the court that was deciding on custodial measures for detained sailors and that the first accused would be kept in custody until January 25. ‘It is obvious that this is an additional complication to the processes that are underway in Ukraine. This will or may create, in any case, serious problems for the economy of Ukraine. But this, of course, does not improve relations between the Russian Federation and Ukraine’, Russian Prime Minister Dmitry Medvedev said. He noted that such moves would aggravate the situation in Ukraine. ‘This is politics, this is electoral technology, that is political spin machines. And this is how it is perceived within Ukraine itself. And I perceive it like that’, Medvedev added. ‘This [further sanctions] has not been discussed yet. But, generally, I would not take it off the table. This is not being discussed at the moment. There must be full clarity on the circumstances in full detail. But my opinion is that such behaviour that influences another state or violates the sovereignty of another state cannot be without consequences, and I also think that we cannot introduce sanctions once and then have no further sanctions. In my opinion, the topic should not be off the table, rather, it is one of our few instruments,’ Norbert Roettgen, the chair of the Foreign Affairs Committee in the German parliament told Deutschandfunk broadcaster. Roettgen, a member of the Christian Democratic Union (CDU), one of the parties in Germany’s ruling coalition, added that all options to solve the issue should be considered, barring a military one. The lawmaker added that German Chancellor Angela Merkel was right to have spoken to both sides in the incident. ‘I believe that common sense should prevail in the end. And at least some manifestations of that common sense are shown even by today’s biased Western leaders, who call for the restraint of both parties. It is a so-called reluctant acknowledgement of the fact that the Ukrainian party is to be blamed [for the incident] even in their opinion’, Russian Deputy Foreign Minister Alexander Grushko stated. Antonio Guterres said he was ‘greatly concerned’ by the incident near Crimea and urged both Moscow and Kiev to ‘exercise maximum restraint and to take steps without delay to contain this incident and reduce tensions’. ‘I do not see any need for mediators,’ Lavrov said when asked whether Moscow believed the situation had gone so far that the assistance of mediators was required. ‘As you know, yesterday we convened the UN Security Council; Ukraine also spoke in favour of convening such a meeting. I think it was useful for everyone to listen to the truth about what happened. But it primarily depends neither on the [UN] Security Council, nor on the OSCE, nor on any other organization, but on the sponsors of the Ukrainian leadership, who must strongly warn it [Kiev] about the inadmissibility of playing with fire in such a way’, Lavrov told a press conference after talks with his French counterpart, Jean-Yves Le Drian. ‘We want peace in the Black Sea region. We want Russia and Ukraine to work together, rather than against each other. We again urge them to sit down and resolve the problem diplomatically,’ Erdogan said, addressing his ruling Justice and Development (AK) Party’s parliamentarian bloc. 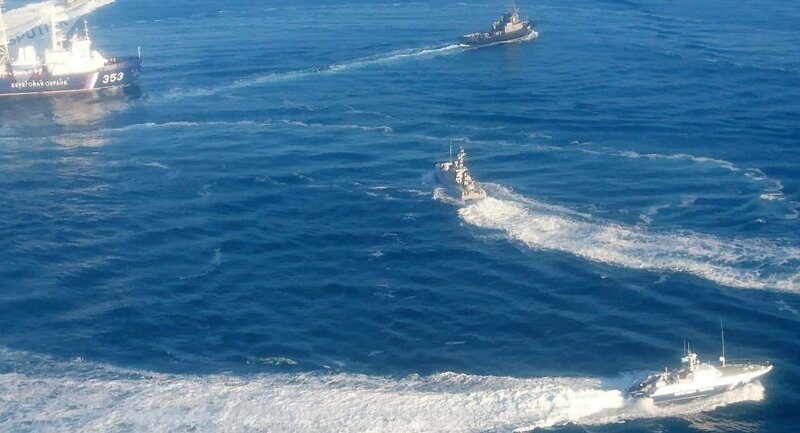 ‘SBU Head Vasyl Hrytsak confirms the presence of officers from the SBU Military Counterintelligence Department on board the Ukrainian ships attacked and seized by Russia in violation of international legislation in the Kerch Strait on 25 November 2018’, the SBU press service said. According to the statement, these officers were providing counterintelligence support to the Ukrainian naval unit. ‘The Security Service of Ukraine takes all necessary measures within its area of responsibility to release Ukrainian captives and return them to their families. At the same time, the Security Service of Ukraine requests the top command of Russian intelligence to halt psychological and physical pressure on Ukrainian soldiers, currently being exercised to justify the act of flippant aggression’, the press service added. Asked how Moscow had reacted to the US president’s statement, Peskov replied, ‘I do not know. I will not comment on this’. Trump told reporters on Monday he did not like ‘what’s happening’ in the Kerch Strait separating the Black Sea from the internal Sea of Azov and said he was working on the matter with EU partners. MOSCOW (Sputnik) – The UN Security Council’s reaction to the Sunday incident in the Kerch Strait may encourage Ukraine to stage further provocations in the Black Sea and in the Sea of Azov, Russia’s First Deputy Envoy to UN Dmitry Polyanskiy told the RT broadcaster. ‘The situation does not need appeasement. Appeasement occurred the day before yesterday when our border guards appeased violators of Russia’s state border. If I am not mistaken, there will be a trial today. That’s all appeasement’, the spokesman said, adding that the fate of the Ukrainian sailors who had violated the country’s state border depended on the court’s ruling and not on the Kremlin’s position. ‘As for discussing the Sunday incident at the summit, this is not a topic to be on the agenda of the G20 summit itself. But at the same time, if any questions are raised during bilateral meetings with the [Russian] president on the sidelines of the summit, undoubtedly, the president will provide sufficient explanations’, Peskov stressed. The G20 summit will be held in Buenos Aires on November 30-December 1, bringing together the leaders of the world’s 20 largest economies. MOSCOW (Sputnik) – Russia’s Federal Security circulated video footage on Monday where a detained Ukrainian naval officer admits that he recognized the provocative nature of the actions of the Ukrainian navy during the incident in the Kerch Strait. ‘You know that from the very beginning of these provocative actions he received comprehensive information from our border guards and relevant agencies. When the time comes, the president will give all the necessary clarifications. In particular, he will probably talk to the media in Argentina, therefore, I think, the president will voice his position in the coming days’, Kremlin spokesman Dmitry Peskov told reporters.